I had lots of trouble sleeping last night. I was tossing and turning, feeling nauseous, hot, cold, anxious... It was about time the night ended! Today, I had my first appointment. Finally, this awaited and dreaded moment had arrived. 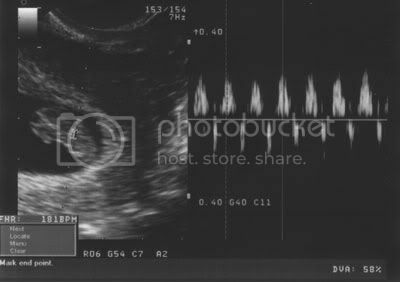 I knew I would not have an u/s and probably would not hear the heartbeat, so I did not think there was much to expect. I did not expect this appointment to calm my fears at all. P was also stressed and frustrated because I would not have an u/s. We arrived at the clinid, anxious and nervous. The nurse asked us to sit in an exam room and wait for the dr. In the rooms next to us, we could hear him going from one round belly to another with his doppler, making everybody hear the little beating hearts. P was very irritated by that, he felt he should be hearing his baby's heartbeat, not everybody else's. I knew he would not let this go and frankly, I wanted him to say something about it. The dr comes in, quickly looks at my chart and says: "Finally you are pregnant! That's wonderful! After all these treatments, the Femara did it! I'm amazed!" He asks a few questions, explains all the next appointments and tells me I will have one u/s at 18 weeks (yeah, I know!). I tell him the nurse did not write the right EDD because my cycle was a bit longer. He asks me when was the last time we did a pap-test. I don't remember when, so that must mean we need to do one now. He says "Well, we're gonna do one now. And you're gonna need to do an u/s so we can tell exactly how far along you are, since your cycles were not regular." I step on the exam table. P asks him if we need to take an appointment at the hospital for the u/s and if it takes a long time. The dr says "Oh no! we're gonna do one here, now!" P and I look at each other, eyes as big as $2 coins, our mouths wide open and our hearts beating fast. This is so much better than what I ever hoped! And we didn't even have to beg! On the screen, we see a small gray spot appear. Is it true, is it really Pépin we're seing here? It's so tiny, so beautiful! It measures 8w6d, which is right on target since I am 8w5d. Its heart is beating fast, little white spot and strong rythm. We finally hear it, the sound of our baby's heart. P is sitting there, his eyes full of tears and his heart already full of love for this tiny little being. I'm laying on the table, laughing like an idiot, so in chock, hoping not to wake up from that wonderful dream. After all this time, can it finally be true? Everything seems perfect. As my doc said, this one's a keeper. As of my lack of symptoms, there's nothing to worry about, of course. I am one of the lucky ones that go about without nausea. For once in my life, I am on the good side of statistics! 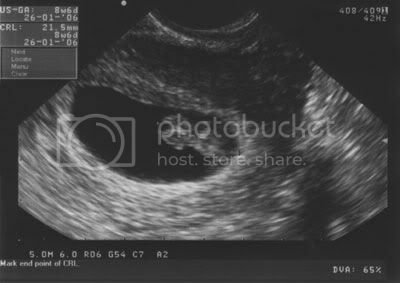 The fertility gods have decided I have paid my dues and deserve a little break. Even if I know this war is still not over, seing and hearing Pépin and knowing things are ok for now has brought such a peace to our heart. A peace I had not felt since... since forever I guess. I can't stop smiling, my cheeks hurt! I will do the prenatests in 3 weeks, so I will get another u/s. What wouldn't I do just to glimpse once more at our baby? What can I say, I'm in love! I'm so glad everything looks wonderful! I'm smiling with you! Wow. Wow. Wow. Just Wow. Oh thank God! All looks good, are there more beautiful words?? I truly - and I mean TRULY - amd delighted for you. Oh Kiwi, I'm so happy you got to see the heartbeat and everything is where it should be. It's awesome that you didn't have to wait. YAAAAAAY Kiwi!!! I am soo excited. I am in tears reading your blog. You are so deserving of all of this that is going on. Your baby is sooo cute! I'm so glad you feel better now. Hooray for you and Pepin! I'm so glad you got to see the little heart. I am only two days behind you. We should have a joint shower.